Hellish lines formed today all across Japan. Splatoon 2 launched, and stores got a fresh shipment of Switch consoles, including the Splatoon 2 hardware bundle. No doubt there were people waiting to just get Splatoon 2 and its Amiibos, but with theway things are in Japan Switch-wise, many folks were certainly hoping to get the bundle or the standalone console. Twitter user Kaztsu took some terrific images of the lines in Tokyo, which got longer and longer as the morning progressed. As before, those wanting a Nintendo Switch lined up to get a raffle ticket with the hope that they would be selected so they could buy a Switch. The odds of that were slim. Today was a hot one! Around 1,500 people were apparently waiting at the Labi store in Tokyo’s Ikebukuro earlier today. The lines weren’t only in big cities like Tokyo, but even in the suburbs and small towns. Four hundred people lined up at a Toys“R”Us in Ehime Prefecture. Ehime! At this Toys“R”Us, there were 25 Splatoon 2 Switch bundles and ten individual Switch consoles. Around 500 people lined up for a chance to buy. Fewer there, though. Ten Splatoon 2 Switch bundles and ten individual consoles. 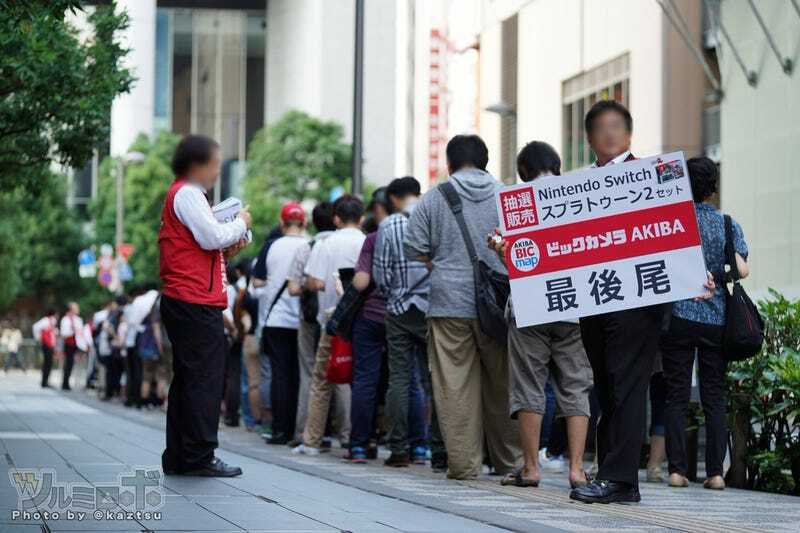 People at a Toys“R”Us in Tokyo’s Ikebukuro were hoping they’d win a chance to buy one of 15 Switch consoles. Another Toys“R”Us, with reportedly about 400 people in line. A long line at a Toys“R”Us in Osaka. This shop had 30 Splatoon 2 Switch bundles and 20 individual Switch consoles. The line was reportedly over 1,000 people long. Apparently a Splatoon 2 line. These folks are hoping to win a chance to buy one of 45 Switch consoles. Truly. And don’t expect them to end any time soon.